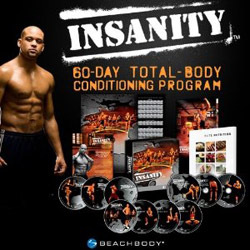 Shaun T. Insanity Workout created by Beach Body is the latest 60 day home fitness program. The fitness workouts are completely weight free, using a combination of cardio and using your body for resistance training. It claims to allow you to be able to produce results in 60 days. If you are looking for a hard and result driven then this workout for you. The workout is intense, tough and gut wrenching. Definitely an advance workout but you will get results if you persist. Tags: Beach Body Insanity Reviews, Insanity Reviews, Shaun T. Insanity Workout, Insanity Workout Reviews, Shawn T. Insanity, Shaun T.
With your help we can reach more people and let them know about Shaun T. Beach Body Insanity Fitness Workout whether this product works or not. I'm on day 9 of Insanity workout and I can already see a difference in my legs, stomach and face. It truly works, just watch what you eat and you'll be on your way. Good Luck. I'm on my first week and I am definitely pleased so far. These workouts really get you sweaty and sore.